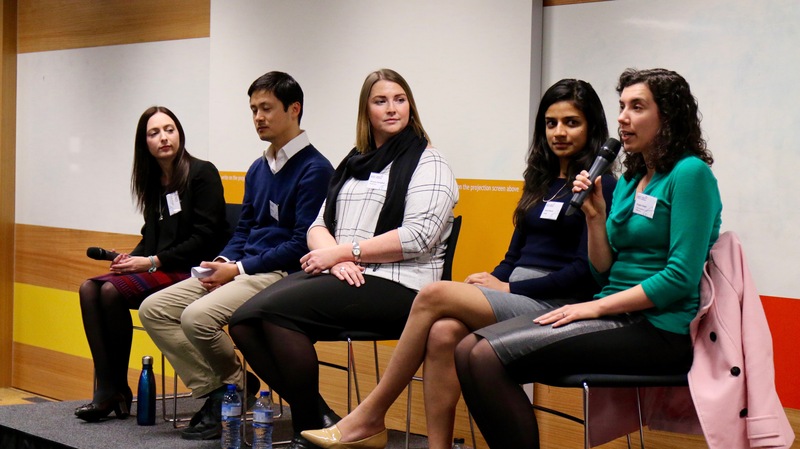 Once again, the Melbourne Business School Student Association (MBSSA) delivered another successful HR panel event featuring graduate recruiters and recent MBS graduates. The event focused on various aspects of the recruitment process, where panellists offered Melbourne Business School (MBS) students a wealth of knowledge on how to stand out in the competitive graduate recruitment market. MBSSA welcomed HR representatives Nicola Campbell (Accenture), Justin Ling (PwC), Angela Grant (University of Melbourne) as well as recent graduate Harini Warrier (Deloitte) and current MBS student, Nadia Okraglik who has secured a graduate job at Accenture next year. Job seekers have access to boundless resources about job opportunities. All the information is out there – it’s a matter of job seekers putting in the effort and time to find it. The panellists encouraged students to subscribe and follow websites such as Grad Connection, GradAustralia, Graduate Opportunities and Careers Online to stay up to date with opportunities. If students don’t know where to start, Ling suggests downloading a list of Australia’s top 100 companies, searching for graduate opportunities and finding companies that align with one’s personal goals and values. From left to right: Nadia Okraglik, Justin Ling, Nicola Campbell, Harini Warrier, and Angela Grant. Panellists recommend going beyond the graduate role job description and focusing on different ways to really understand what the company stands for and their culture. Ling encouraged attendees to subscribe to the company’s communication and social media channels, and said “the more you read and see, the more you know about the actual culture”. He also encouraged candidates to stay up to date with company reports and thought leadership and reflect on whether the company values evident in these align with one’s personal beliefs. Campbell also suggested connecting with recruiters and employees on LinkedIn and reading the type of things they post, while also engaging at career fairs and networking events. Ling emphasised the importance of communicating your passion and interest in joining a certain field. He recalls many instances where graduates say they want to be consultants – but never have a specific answer when he asks them why. It’s important for recruiters to hear about your motivations and interests, because ultimately employees work best when they focus on something they’re passionate about. He said, “if you can find and chase your passions and look at how you can translate this in a working environment – it is really powerful”. Every panel members emphasised the need for job seekers to demonstrate their soft skills including teamwork, communication, problem-solving, leadership and interpersonal capabilities, throughout the recruitment process. Both Okraglik and Warrier developed their soft skills by getting involved in student committees, where they had the opportunity to work within and lead a team. This allowed them to test and improve on these skills in practice, giving them tangible examples which they could draw on in interviews. Having the ability to articulate concrete examples on ways in which they developed and demonstrated these skills are ways in which candidates can stand out to employers. Warrier also encouraged audience members to look at volunteering, part-time work and opportunities outside study to hone in on soft skills. All experiences add to the candidate’s capabilities – it’s just a matter of self-reflecting and communicating these contributions on applications and with employers. 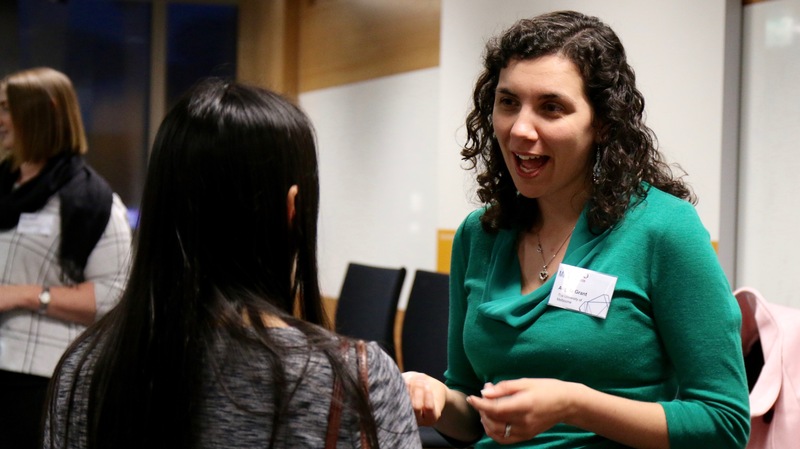 Angela Grant(Manager at The University of Melbourne Graduate Program; Learning and Development Consultant) having a discussion with a student. Although it is the most intimidating step of the process, excelling in the interview stage simply comes down to preparation and practice. In preparing for her interviews, Okraglik would consult her research that was divided into three sections; basic company information; specific information about the relevant divisions; and the main aspects of the role. She encouraged audience members to consult Whirlpool and Glassdoor for less polished versions and stories about the job. Additionally, she identified key behavioural questions that every interviewer would ask and had a scenario in her mind that she could speak to. Furthermore, Grant emphasised that adding complexity when answering behavioural questions was a great way to stand and advised against standard examples for demonstrating teamwork skills. To help with this, she suggested candidates reflect on some of their biggest difficulties and challenges, which could have led to their greatest successes. Rejections during the application process can be demoralising – yet these setbacks should be seen as a learning experience and opportunity to demonstrate resilience and drive. Warrier recalls applying for over 100 jobs and found it was important to not get bogged down and persevere. She encouraged students to “play smart and think about the bigger picture”, and adjust their application strategy if it wasn’t working. This may involve re-evaluating one’s personal value proposition, looking for opportunities in smaller firms or reaching out to personal networks. Networking can be daunting – yet all panelists emphasise that it provides invaluable experience once you reach the business world. It gives you the opportunity to practice speaking with professionals and learn more about the company – its culture and how it operates. From left to right: Abraham Ryan Hito, Celia Zhou, Sonia Shah, Siddharth Gupta, Whitney Zhou, and Nicole Rossdale. MBSSA warmly thanks the panellists for their time and contribution to the this rewarding discussion.